Everything is included in the base trim with the X3 as well. You’ll get fuel efficiency as well as a decent horsepower output of 245. Want to upgrade? There are plenty of options and trims to go with. We like the sDrive30i. This new SUV provides rear-wheel power and performance. Want to take a test drive of the latest BMWs? 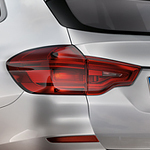 Get into a new X3 when you go for a test drive at DCH Auto Group.